We get asked this all the time. White Wonder Studios is a unique name, and elicits a variety of theories from those trying to figure out its origins and meaning. Initially “white wonder” was intended as an synonym for snow. Isaiah (our owner) grew up playing in snowdrifts and weathering blizzards, so the name seemed fitting. Then something crazy happened: Isaiah found himself on bottom of the world living and working in Antarctica as a firefighter for the Antarctic Fire Department protecting McMurdo Station and the military airfields from the threat of fire. Each member of our team is an artist in their own medium – whether it be graphics, code, writing content, etc., and artists are typically found in studios. This is why you find “studios” in our company name. Even though it’s more than 8,223 miles away, Antarctica is very close to us at White Wonder Studios, as we’ve all heard stories from Isaiah’s adventures. The experiences he had on “the ice” really resonated with him and he brings those experiences, lessons, and values to our team’s core. Observation Hill is the large hill (small mountain is more like it) immediately adjacent to McMurdo Station on Ross Island. From the viewpoint of this photo, McMurdo Station is just on the other side of Ob Hill. 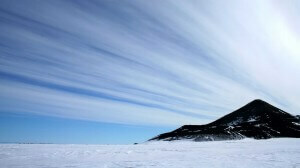 Isaiah took this photo while out on Antarctica Survival & Safety Training lovingly known as “Happy Camper” training. 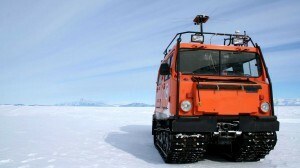 This photo is of a Hagglund – a tracked vehicle that is a staple of the USAP vehicle fleet for expeditions out onto the sea ice and camps. In the background is Mount Discovery. Isaiah took this photo while out on an training expedition to learn how to assess and measure the seasonal sea ice. 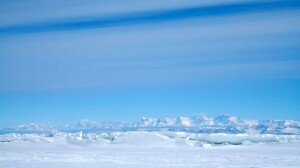 The Royal Society Mountain range lies just across the McMurdo Sound from Ross Island, Antarctica and the USAP McMurdo Station. Isaiah took this picture from the seasonal ice runway while working at Antarctic Fire Department Station 2 – the station protecting McMurdo Station’s airfields. The United States Air Force 62nd Airlift Wing & 446th Airlift Wing operate the C-17 Missions as a part of “Operation Deep Freeze”- a part of the Joint Task Force – Support Forces Antarctica. The missions carry personnel and supply equipment, and land on the seasonal ice runway or Williams Field packed ice runway. Isaiah took this picture from the seasonal ice runway while performing a “hard stand” operation with the Antarctic Fire Department, standing by while the C-17 was landing, unloading, and departing. Mount Discovery is directly across McMurdo Sound from McMurdo Station, and one of the most prominent mountains in the immediate vicinity. This picture was taken at 02:29 AM from Isaiah’s barracks/dorm room window. During the summer the sun never fully sets in Antarctica, but rather makes an elliptical circle around the sky, dipping slightly behind the mountain ranges during the early and late parts of summer.